The anthracite-colour metal stand in three heights made by our Glasi metalworker. 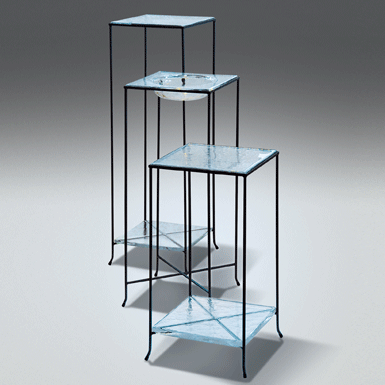 Add to it heavy cast glass plates: a flat plate, a base plate with cross or Carré Valle, a bowl with indentation, which fits perfectly into the stand. Carré Valle can also stand alone. They also come in two smaller variants.